The parish of Ludham is situated in northeast Norfolk, just above Horning. Its name comes from the Old English for ‘Luda’s homestead’. It covers a little under 3,000 acres of land and is bounded on two thirds of its perimeter by rivers and marshland. The parish has a long history and was certainly well established by the time of the Norman Conquest, its population, land ownership and productive resources being extensively detailed in the Domesday Book of 1086. The earliest evidence of human activity comes in the form of a few prehistoric but otherwise undateable worked flint implements (NHER 21790 and NHER 34004). There is then a chronological gap until the Bronze Age, which is represented by three copper alloy axeheads (NHER 18013 and NHER 21440) and a Late Bronze Age flint dagger (NHER 8438). Aerial photography has also revealed the cropmarks of two possibly Bronze Age ring ditches (NHER 36130 and NHER 45067), the flattened remains of circular burial mounds. 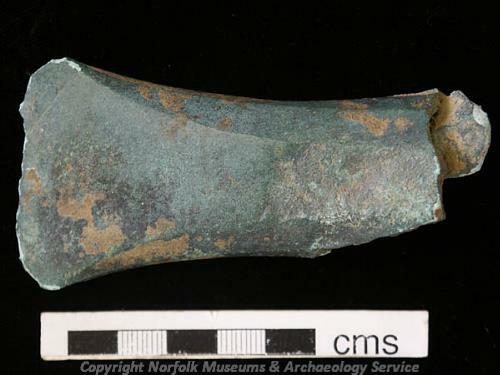 There are no definite Iron Age finds so far, although part of a copper alloy finger ring (NHER 18889) may date to this period; however, it might equally well be Roman. Roman finds are currently limited to coins (NHER 8439 and NHER 34665), although aerial photography has revealed the cropmarks of a possible military camp or settlement (NHER 36753) to the west of the parish. There is currently no evidence of Saxon activity. The medieval period has left the parish with its oldest surviving building, St Catherine’s church (NHER 8457) in the middle of the village. 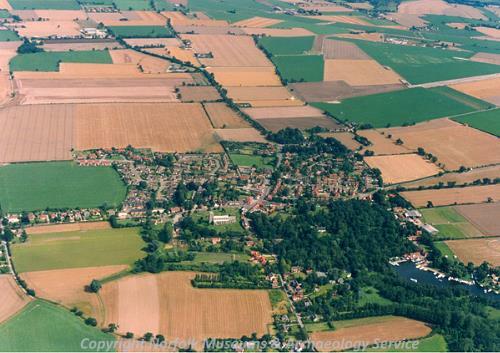 The village's connection with St Benet's Abbey (NHER 5199) in the neighbouring parish of Horning, whose ruins are nearby on the banks of the River Bure, goes back to before the Norman Conquest, and successive Bishops of Norwich spent much of their time here. This may partly be the reason for the church's size and the fine quality of its window tracery and arcades. The west tower and chancel are 14th century and later, the rest of the church being mainly 15th century with 19th and early 20th century restorations. Among many items of interest inside are the hammerbeam roof to the nave, dating to about 1466, the chancel arch with its carved capitals of grotesques and seaweed foliage and a rare Royal Arms of Elizabeth I. More spectacular are the exceptional 15th century decorated octagonal font and one of the finest rood screens in Norfolk, dating to 1493. Other medieval buildings have not survived. No trace remains of medieval Walton Hall (NHER 8453), the site of which is now a cultivated field partly covered by airfield buildings. Examples of medieval finds in the parish include pottery fragments (NHER 8440), buckles (NHER 18013 and NHER 24864), coins (NHER 18888 and NHER 36232), a Papal bull (NHER 32275) and a forged silver coin (NHER 21790). Further evidence of medieval activity can be seen at Crome Broad (NHER 13511) and Womack Water (NHER 13513), both of which are flooded peat cuttings. As mentioned above, parts of the parish are marshy, and the post medieval landscape was marked by a number of windmills for draining the marshes to enable the grazing of stock. Some of these have since disappeared, leaving only an earthen mound, for example Bridge Mill (NHER 8455) and Coldharbour Windpump (NHER 17525), which was used to feed a head of water to Ludham Bridge Mill. Others were later converted to different uses, like the tower mill at The Mill House (NHER 5242), a mill of 1823 used until the late 19th century when its sails were removed. It was later a water tower and has now been converted to a house. The derelict drainage pump NHER 5236 north of Ludham Bridge was converted to a rather interesting two storey pillbox in World War Two. Still others are merely derelict towers, like Womack Windpump (NHER 14669), but Boardman’s Mill (NHER 5241), built in 1897, has been fully restored. Also restored is Ranworth hollow post wind pump (NHER 23359), the only remaining example of a hollow post wind pump. It was built in the mid 19th century but had fallen into disuse by 1903. In the 1980s, it was moved to its present position and restored to pump water from the marshes into the River Ant. Other types of industrial post medieval structure to survive are kilns. A probably 18th century brick kiln (NHER 8441), complete with bricked chamber and flue tunnel, was exposed by ploughing in 1959, and again during pipe laying in 1966, and a circular flint and brick lime kiln (NHER 17527) with a pointed entrance and rake holes was surveyed in 1980. Of post medieval residential buildings, the one with probably the oldest origins is Ludham Hall (NHER 8454). This was the site of the Palace of the Bishops of Norwich, which burnt down in 1611 and was partly rebuilt by Bishop Harsnett, a chapel being added in 1627. The current flint and brick hall is late 18th century, but based on the original gables and rear elevation. The chapel, which stands at right angles to the house, is of brick with a slender square west tower, linked to the house by a late 18th century parapet. The interior has been gutted and it is now used as a barn. To the east is an early 18th century brick barn, and to the west a late 17th century brick garden wall. Hall Common Farmhouse (NHER 14666), about 1700. Toad Hole Cottage (NHER 22150), The Stone House (NHER 44511), 1 to 5 Yarmouth Road (NHER 44506), The Stores (NHER 44512), Saddlers Shop (NHER 44510) on Norwich Street and Bacon’s Manor (NHER 8453) are all 18th century. The Mill House (NHER 44505) dates to 1825. Without doubt, though, the Best In Show award must go to Howe Hill House (NHER 5243), a perfectly sited Jacobean style Edwardian house overlooking the River Ant and stretches of Reedham marshes. It was designed and built in 1903 by the architect Edward Boardman, initially as a holiday home. The house is two and a half storeys high, of roughcast brick with irregularly placed leaded windows and a roof of decorated thatch. A sun parlour was added to the west of the house in 1910. By 1916, the whole house had been extended, moving the sun parlour with it, and a large bow ended drawing room built as a single storey wing projecting south. A third decorated chimney stack was also added, matching the two existing ones. Inside there is plenty of panelling, a big staircase to the rear and moulded chimney pieces. As the building was being altered and extended, Boardman planted 70,000 trees on the estate and set out the formal gardens to the south and west. In 1918, the house became the family's main residence, and in 1966, sixteen years after Boardman's death, it was sold to the County Council and is now a residential education centre. Other buildings have not survived. Lower or Green Farm (NHER 37142), a 17th century farmhouse with a 19th century barn and stable was demolished as recently as 2003. Royal Garret’s House (NHER 21643), a 17th and 18th century L-shaped house was knocked down in the 1960s. Part of the Midland and Great Northern Railway (NHER 13581) ran through the parish. This was a railway line that linked Great Yarmouth to Sutton Bridge via Stalham, North Walsham, Aylsham, Melton Constable, Fakenham and King's Lynn. It opened in stages between 1865 and 1933. All of the line is now closed, although some sections survive as paths. A number of stations, signal boxes, goods sheds and concrete mileposts remain. During World War Two there was an airfield (NHER 8456) in the northeast of the parish, used as a satellite field for RAF Coltishall. There is still an airstrip, and some buildings remain, but most of the area is now under cultivation. Two concrete pillboxes also survive from this time (NHER 14970 and NHER 32581). Near the Post Office is a type K6 telephone box (NHER 44509), which was built to a 1935 design by Sir Giles Gilbert Scott. Piet Aldridge (NLA), 11 October 2006.